The images created by this term range from the romanticized free roaming noble stead to the vicious mangy scourge of the west. 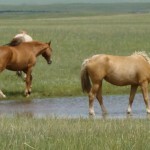 Neither image is accurate, for as with ‘domestic’ horses there are the noble and the outlaws mixed with the ordinary. 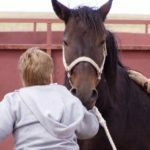 Our opinion is that a horse-person who knows how to pick a horse based on personality and confirmation can find an outstanding companion in a Mustang. By natural selection, the dummies and the unsound did not survive nor did they survive long enough to reproduce. Thus what is left is the cream of the cream with superior intelligence and athleticism. And, of course, we feel we have managed to pluck the best from the wild herds. Our senior Curly sire, Bit-O-WY Mellow, came to us from a BLM adoption as a yearling. At that time we had no intention of becoming horse breeders but Mellow so impressed us with his attitude and looks that we opted to leave him intact. His first crop of foals demonstrated the same calm willing attitude with the added bonus of his color and curls. Add to this the second horse adopted at the same time, a smaller appaloosa Nez, turned out to be equally sensible and willing and we quickly became believers that Mustangs are not necessarily the uncontrollable nags so often described. 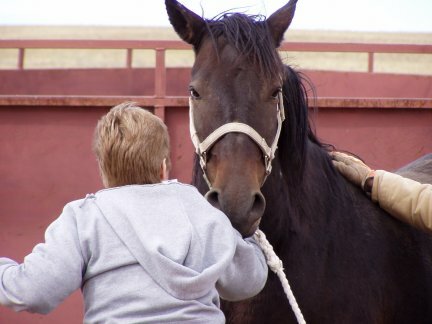 Nez, as a 2-year-old stallion, became companion and mount to a woman who was able to walk with much assistance and unable to balance or mount and dismount on her own. Nez allowed her to be boosted on which was accomplished in a prone position, stepped out soft and gentle and then stood quiet as she rolled off which ever side was convenient. Unfortunately we lost Nez due to complications of gelding. However, his replacement, Splash, is every bit as special as his predecessor and provided Bonnie her birthday present of being able to ride her horse after being in hand 1 month and having only about 6 hours of work. As her disease progressed, he continued to provide her enjoyment by resting his head in her lap so she could scratch him and spoil him with treats.